Andy Reese was a versatile utility player for John McGraw’s New York Giants from 1927 to 1930, and he was a star of the Memphis Chickasaws of the Southern Association from 1931 to 1939. He is the “hit king” of the Southern Association: His 1,642 hits were more than any other player achieved in the league’s 73-year history. In April 1927 Reese had six hits and scored four runs for the Giants in an exhibition game against his old team, the Chickasaws.11 In his first major-league game, he played left field and hit two singles as the Giants defeated the Philadelphia Phillies. In May Reese made a spectacular shoestring catch in right field and smacked two hits off Reds pitcher Eppa Rixey.12 Reese played third base, batted leadoff, and scored four runs in a win over the Cardinals in July. 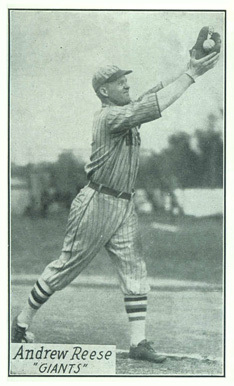 Reese finished the 1927 season with a .265 average in 355 at-bats. In the offseason he married Margaret Stone of Madisonville, Kentucky, in a ceremony at Clarksville, Tennessee.15 One of the attendants was Horace “Hod” Lisenbee, a Clarksville native who won 18 games in 1927 (including five against the Yankees) as a rookie pitcher for the Washington Senators. Reese and Lisenbee were teammates at Tupelo in 1925 and at Memphis in 1926. In early 1928 Reese and teammate Lefty O’Doul trained with 41-year-old Ty Cobb in Cobb’s hometown of Augusta, Georgia, prior to Cobb’s final season. “He made Lefty and me come out every morning at 7 o’clock and hit,” said Reese, who gave credit to Cobb for O’Doul’s 1929 NL batting title.16 The tutoring must have helped Reese, too; he batted .308 in 1928, with only 24 strikeouts in 406 at-bats. New York sportswriters were impressed with Reese’s athleticism and charmed by his down-home country manner. They called him “the Tupelo Flash”18 and also “Handy Andy”19 for his versatility. “Tupe,” as his teammates called him, was one of the most likable men on the team.20 One reporter wrote about Reese’s watermelon patch and his 104-pound watermelon that won first place at the Tupelo county fair.21 Another writer described Reese’s accent as “the thickest Southern brogue in the big leagues.”22 Reese’s teammates included Hall of Famers Bill Terry, Travis Jackson, and Mel Ott, all from Dixie. Reese suffered a foot injury early in the 1929 season and was seen “hobbling from clubhouse to dugout on an infected foot.”23 The foot improved, and in consecutive games against the Cardinals in late July, Reese batted leadoff and went 6-for-12 with five runs scored and four stolen bases. However, a week later, he had “a bad foot again”24 and was sidelined for the rest of the season. He finished the year with a .263 average in 209 at-bats. In April 1930 Reese hit a grand slam against Brooklyn. He developed a sore throwing arm early in the season, which one reporter described as “so lame that he really belongs on the bench.”25 Reese played sparingly and was demoted in late August to the Bridgeport (Connecticut) Bears of the Eastern League, one of the Giants’ farm clubs.26 His once-promising major-league career was over. In the offseason the Giants traded Reese to the Oakland Oaks of the Pacific Coast League.27 In April 1931 he hit two home runs for Oakland in a game against Los Angeles.28 His arm troubles continued, though,29 and the Oaks released him in June.30 He rejoined the Memphis Chickasaws, and thus began his remarkable run of nine seasons as a star and leader of the Memphis team. From 1931 to 1939, Reese batted .317 for the Chicks, with an average of 32 doubles, 10 triples, 6 home runs, 83 runs, 85 RBIs, and 14 stolen bases per season.31 He played mostly first base, but also spent time at second base and in the outfield. He was a model of consistency, batting over .300 seven of the nine years, and never lower than .281. The Chicks had a winning record in all but one of those nine seasons. Norris Caldwell Jr. played on Tupelo High School baseball teams in the 1940s. “To all of us growing up in that era, Andy Reese was our idol,” Caldwell said.38 Reese attended high school games and encouraged the young ballplayers. Reese died on January 10, 1966, in Tupelo. In 1969 he was inducted into the Mississippi Sports Hall of Fame.42 Since the 1970s, young ballplayers have been developing their skills at Andy Reese Field, 1107 Joyner Avenue in Tupelo – a fitting tribute to the Tupelo Flash. 1 Sources disagree on his year of birth. 4 Hattiesburg (Mississippi) American, November 2, 1922. 6 Palm Beach (Florida) Post, January 30, 1941. 7 Kingston (New York) Daily Freeman, August 19, 1925. 8 Marshall D. Wright, The Southern Association in Baseball, 1885-1961 (Jefferson, North Carolina: McFarland, 2002). 9 New York Sun, May 24, 1927. 10 Cortland (New York) Standard, July 14, 1927. 11 Buffalo Evening News, April 5, 1927. 12 New York Sun, May 16, 1927. 13 Hendersonville (North Carolina) Times-News, February 2, 1957. 14 New York Sun, July 7, 1927. 15 Brooklyn Daily Eagle, December 5, 1927. 16 New York Mirror, July 20, 1961. 17 Buffalo Courier Express, December 10, 1928. 18 Rome (New York) Daily Sentinel, March 30, 1929. 19 Niagara Falls (New York) Gazette, August 11, 1927. 20 New York Sun, January 2, 1931. 21 Cortland (New York) Standard, August 10, 1927. 22 Gloversville/Johnstown (New York) Morning Herald, September 26, 1928. 23 Brooklyn Daily Eagle, May 14, 1929. 24 Brooklyn Daily Eagle, August 3, 1929. 25 New York Sun, June 2, 1930. 26 Brooklyn Standard Union, August 30, 1930. 27 Poughkeepsie (New York) Eagle-News, December 31, 1930. 28 Salt Lake Tribune, April 22, 1931. 29 The Sporting News, May 7, 1931. 30 The Sporting News, June 18, 1931. 31 Marshall D. Wright, The Southern Association. 32 The Sporting News, October 20, 1938. 33 The Sporting News, May 23, 1956. 34 It is unclear whether Reese or Eddie Rose is the all-time Southern Association leader in RBIs. Rose had 866 RBIs, and Reese had either 867 or 865 RBIs, depending on the source. 35 Tupelo (Mississippi) Daily Journal, January 11, 1966. 37 Tupelo Daily Journal, January 11, 1966. 38 Norris Caldwell Jr., letter to author, November 17, 2013. 40 Monroe (Louisiana) Morning World, May 6, 1934, and Hattiesburg (Mississippi) American, May 30, 1938. 41 The Sporting News, July 22, 1959.